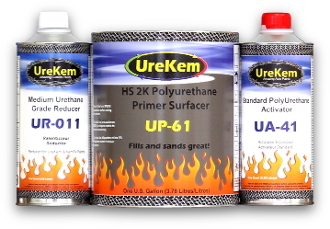 KemFill 2K HS Urethane Primer Surfacer 1.5 Gallon Kit - Buy Custom Paint For Your Automobile Or Motorcycle At Discount Prices! KemFill UP61 is a two component polyurethane primer surfacer designed with urethane reactant copolymers, filling extender pigments, and additives to create a primer that applies easily, fills imperfections, and dries quickly to an easy sanding finish. Mixes 4 parts UP61 series primer with 1 part UA Series activator and then reduce as needed (typically applied at 4:1:1). May be reduced with additional reducer for use a 2K urethane sealer. Available in quarts and gallons. Check your local regulations for compliance issues. We offer Low V.O.C. finished for customers in areas that require Low V.O.C. compliance. 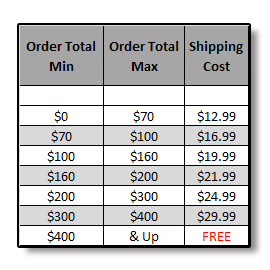 Contact us for more information at info@thecoatingstore.com.